Well, overall I'm pretty mad at my garden. I've called it some very harsh names like, "butthead" and "stupid." Extreme heat, me not watering, weed overload and insect invasion are just a few reasons why I am so frustrated with it. I did take the time to water today and to snap a pic with my phone. Look at these colors! I think I need to stick with tomatoes and peppers for a while (low maintenance & heat lovin'). It's the first post on my new blog layout! A sugar baby watermelon. Which unfortunately, don't tell anyone, I picked too early. It was completely white inside (but it was sweet). See more things grow here. I am very pleased with the sunflowers that I planted! The variety is called Summer Evening and the colors are beautiful. Sunflowers are fun because they grow easily, their size is impressive and the blooms are B-I-G and colorful. 10 weeks after planting the seeds. Sadly, it appears that my parsley from last year is on the verge of bolting. So I said to myself, "Self, you better use that stuff!" Did you know that the root of parsley can be roasted and eaten? I didn't either. It's similar to a parsnip with a carrot-parsley twist. If you're interested in cooking with it look at this lovely Parsley Root Stew recipe. What about these Parsley Root Fries (I could eat the photo)!? With an abundance of parsley, mint and tons of green onions in the garden I was thankful that I ran into my neighbor, Jean, at the market the other day. She gave me the idea of making Tabouli with rice. Tabouli is a Parsley Salad that is enjoyed by many cultures around the globe (or "the world ball" as my youngest calls it). Tabouli is special! 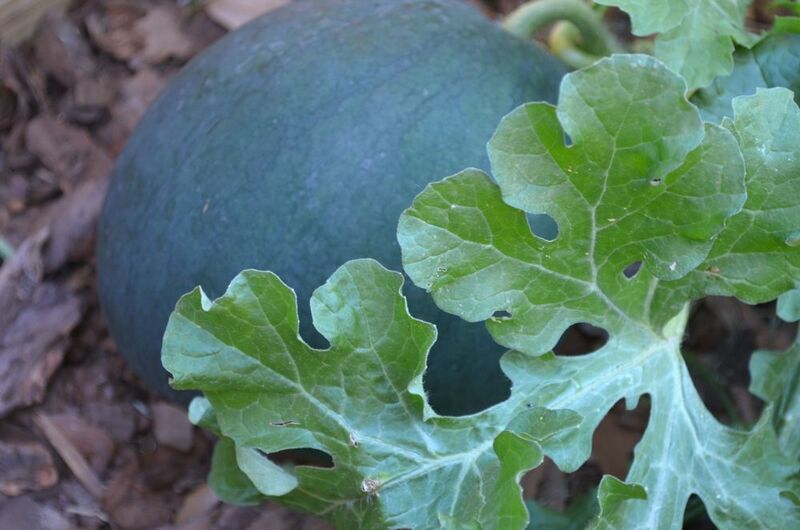 It has a bright, fresh taste and it's packed with nutrients and zesty flavor. It's traditionally made with Bulgar (cracked wheat berries) but it's surprisingly tasty with rice and that makes it gluten-free. I used basmati in the picture. It can also be made with quinoa or couscous. So, this recipe is a "choose-your-own-grain Tabouli"
This authentic Israeli Tabouli recipe was my inspiration. Speaking of teeth, do you want a FREE Sonicare toothbrush? Check out the details of my giveaway here! Here's another bore-you-to-death lettuce post, but this time it's Black Seeded Simpson! It's leaves are vibrant light-green and airy. This lettuce is tasty and has a delicate texture. It's supposedly a heat tolerant lettuce but it bolted much faster than the Rougette de Montpellier lettuce that I planted at the same time. By "bolted" I mean, gets tall, turns unbearably bitter and eventually produces flowers and then seeds. This normally happens in the heat or when the plant has run it's course. Lettuces prefer cool weather. This post is from a series that I've titled STAGES click to see more. Oh and I have a fun giveaway going on now. Check it out. I planted Rougette de Montpellier lettuce. I can't pronounce it, but it's delicious!! It's a butterhead lettuce, with NO bitterness. Lettuces do prefer cooler weather, so it's best to plant them in the fall. I planted this in the spring (zone 9) and it has been slow to bolt. This is a great lettuce to plant and I will definitely plant it again! Lettuce sprouts quickly, you can enjoy a garden fresh salad in no time! Do you like how I sound like a commercial for growing lettuce? This post is from a series that I’ve titled STAGES. It’s where I document the progress of what I’m growing from seed to harvest. I have a giveaway going on now! Check it out here. Well, it's been 6 weeks since I planted my Spring garden check out the before and after pics... First signs of "fruit"
Week 2 first sign of "true leaves"
See the growing stages of other plants that I've started from seed here. This is my second post in a series that I've titled STAGES. It's were I document the progress of what I'm growing from seed to harvest. It may bore you to death or it maybe kind of interesting? We will see! I planted Genovese Basil seeds in egg cartons. After the basil grew it's first true leaves, at 3 weeks, I transplanted it. If you want to see more, subscribe! This is from a series that I’ve titled STAGES. It’s were I document the progress of what I’m growing from seed to harvest. Marigolds are easy to grow and great to plant in your vegetable garden. I planted Cottage Red Marigolds from seed. I started the seeds in egg cartons. I transplanted them 3 weeks later. This picture was taken at 4 weeks. This variety grows very tall. 8 weeks later...beautiful, red blooms. Everything that you need for a fresh salad can be right in your backyard! Lettuce, arugula, tomatoes, cucumbers, sweet peppers and fresh herbs. Sounds good right?! It's simple, practical and perfect for first timers. If you live in a really hot climate, you might want to do lettuces in the Fall. Gardening gloves - I don’t use gloves and my nails look like trash, but I do have beneficial organisms on my skin from the soil, you know, for my immune system (I’m being serious). You might want a big helper. Lay out all of your plants evenly the way that you like them. (I cropped my head out of this one. Yes, I'm THAT vain). The tomato plants should go in the middle. The cucumbers go along your trellis. I put the herbs around the tomatoes allowing enough room for the tomatoes to grow. I like to stager the lettuce and arugula around the edge of the bed, like this: lettuce, arugula, lettuce, arugula. Got me? I put 2 pepper plants at each end between the lettuces and tomatoes. If you like this please share it or subscribe. Place the cage upside down over your tomato plant. Push down it into your soil. Insert the bamboo stakes into the ground around your cage evenly. have someone strong do this. Or use a rubber mallet to pound the bamboo into the ground. This will be your support. Once you have the bamboo how you like it, tie it at the top with your twine. Wrapping it several times. Tie it in a good knot and clip the ends. This bamboo is still green and will dry out over time. Secure the bamboo to your cage with twine all around the cage. You're done! Isn't that pretty? For easy instructions on building a raised garden bed click here. My shed was pretty ugly. I wanted to add more raised beds for my Fall garden. I tore out the patio stones that were behind my house. I added three more beds 4’x4’, 4’x6’ and 4’x8’ and a lot of mulch. There is another full sun area on my property that would be a perfect place to add more beds, but I haven’t decided when I’ll do it. I planted my Spring 2012 garden the other day and I can hardly wait to see how it grows! I’m planning to post those pics in early May. If you want my updates subscribe to my blog. That’s all for now. What projects do you have planned this Spring? Your garden center will probably sell Black Kow composted cow manure. A 50lb bag (10 square feet) is about $5. I haven't been able to find any bad reviews on the product. When I've used it I haven't a problem with weeds in my beds. Mushroom compost is very popular among my friends. A truck full runs about $10 and sometimes it's given away for free. It may be high in pesticides and it may not be completely composted, but it is an excellent humus. (this is not the actual coop I couldn't find an image large enough, click the photo to see what I'm talking about). I know that the genius who thought up seed tape was sitting on the toilet when the idea came to him. If you've ever seen a carrot seed then you know why it's such a brilliant idea. They're SMALL! He must have been in the bathroom because seed tape is little seeds, perfectly spaced and sandwiched between a ribbon of toilet paper. The water breaks the paper down and before you know it, even rows of veggies are springing up in your garden beds! Lay out the "tape" (toilet paper) nice and straight and spaced according to its instructions. Sprinkle with dirt and lightly pat with your hand. Mark your seeds. Water daily, keeping the soil slightly moist. I'll update you as the carrots and beets grow. Until then, let me hear from you! Have you used seed tape before? (3) 2x10x8 Boards. One board needs to be cut in half, don't worry, they'll do it for you where you buy your lumber. Lay out your boards in the shape of the bed. Make sure your corner is flush. You can use a mallet to pound it nice and tight. You're going to screw in 3 screws for every corner. Tap your screw with a hammer or mallet. Make certain there is no gap between boards. Good, now repeat for each corner. STOP! Don't forget that if the 4' board is in the inside (or outside) of the (2) 8' boards then it's going to need to be the same way on the other end too. A blonde ALWAYS forgets this "tip" and has to unscrew and start again! Check out how to plant a "Salad Bowl Garden," perfect for beginners! To learn how to make bamboo tomato cages click here. Come back and see me, subscribe and comment galore!! Thank you Anna for your help! Bye for now. See how seeds grow! It's been 2 weeks & many of my seedlings have begun growing their "true" leaves and are almost ready to be transplanted. I'll let the pictures speak for themselves, if you have any questions feel free to comment. I adore comments! I planted seeds a week ago, remember? Check them out today! Spinach before it develops it's "true leaves"
I'd love to hear from you, What are you planting this Spring? Check back next Tuesday for another update. If you're interested in what seeds I'm starting keep reading and if you're not, well, sorry. March is right around the corner and that's when I'll be planting my Spring vegetable garden. 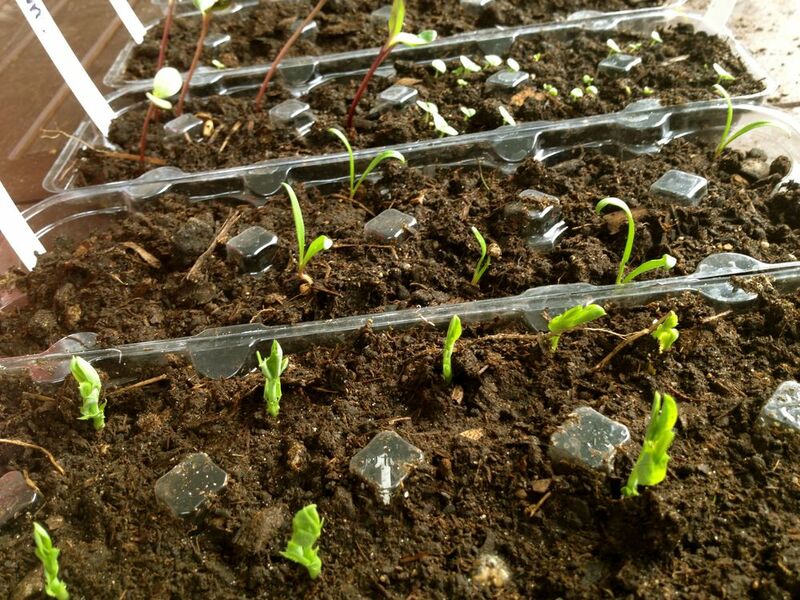 Yesterday (Feb. 14) I started seeds in egg cartons. Some vegetables I'll buy as plants, like my tomatoes for instance, but I wanted to start the bulk of my veggies by seed. I bought everything from Lowe's. I still have a ton of herbs, jalapenos, some lettuces and onions from previous plantings. I love growing things that aren't available at the market. If things go according to plan, I will have red carrots, purple bell peppers and yellow bush beans. These are so fun to eat right off of the vine. Flowers add a lot of color and excitement (for me) to my vegetable beds. Marigolds to ward off pests, Sweet Peas because they smell divine and they climb, Sunflowers because I love fresh cut flowers on my table and Pansies because they're edible and they make sweet garnishes. A word about seed tape! This is the first time that Lowe's has carried it. 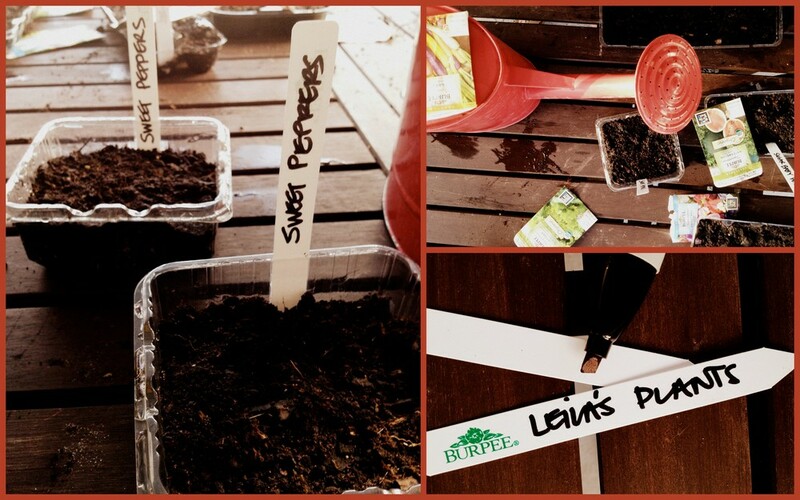 It's great for planting perfectly spaced seeds, especially teensy-weensy seeds. Last spring my carrots were a disaster, they were really crowded. I will plant these directly into my beds in March. Carrots are really fun to grow if you have children around because they can pull up a snack from the ground! I'm missing Summer Squash (the yellow stuff) and Zucchini! When you haven't been to the market and you need a quick, healthy meal from the garden, in olive oil, saute summer squash, cherry tomatoes, garlic, toss it in pasta with fresh basil, make a garden salad and BOOM, dinner! I am doing Pumpkins too, but I'm going to try to time it so that they're ready around October. Wow, that was exhausting! Time for a cat nap.